I’m anchored off Moreton Island, about 10 miles from Brisbane, waiting for a chance to head north to Mooloolaba. It’s been raining heavily since I got here last Tuesday. And just as in each of the last several years there has been flooding in southern Queensland and northern New South Wales. It’s not as bad as last year when there were huge damaging floods all over this area, although the NSW Government is talking about declaring a Natural Disaster. This rain seems to happen when a Monsoon trough from the north - which normally sits between Australia and Indonesia comes south for a while. Anyway, apart from the rain, the winds and seas are more than I want to go to Mooloolaba. I’m booked into the Marina there on Monday 30th, but that won’t happen now. A few more days - maybe Wednesday, if I’m lucky. 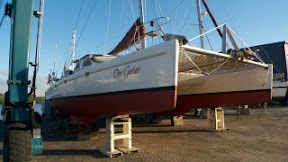 Dos Gatos was re-launched on Friday, newly painted and polished. We were in the yard eight days although, with rain days and a weekend lost, there were only three days of work. We’re staying in the Rivergate Marina for a couple of days. 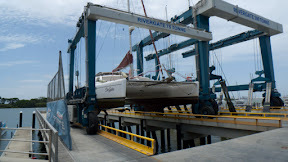 We’re on the hard at Rivergate Marina and Shipyard in Brisbane. It should be a short stay - just bottom paint and prop zincs. The weather finally cleared and we had a window to leave for Brisbane on Wednesday 4th. First we travelled the 40 miles of the Great Sandy Strait between Fraser Island and the mainland. Much of this is easily navigable but the central portion is filled with sand banks. Fate had us arriving at the shallowest part at low tide. We brushed the bottom a couple of times but didn’t get stuck. Then came Wide Bay Bar, the final obstacle before we were in open ocean. Coastal bars can be dangerous in bad weather and this one has claimed several boats over the years. We chose good conditions and while it was rough over the bar we had no problems. The journey down to Moreton Bay by Brisbane was overnight and uneventful. Moreton Bay is also full of sand banks and we had to follow the ship channel to stay out of trouble. We anchored finally Thursday Evening at St Helena Island, a former high-security prison turned National Park just outside the harbor. 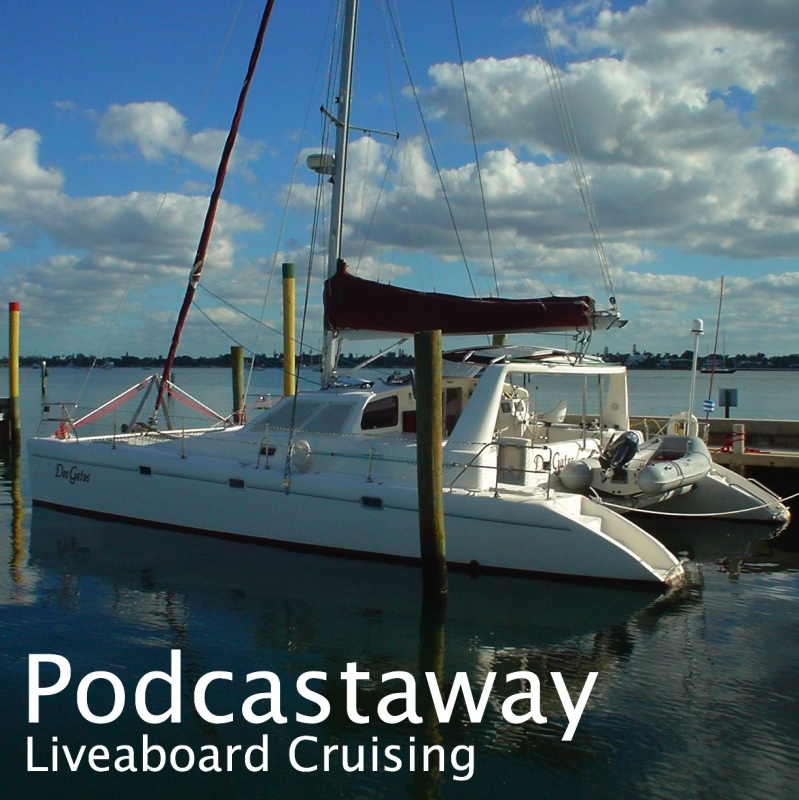 After a few days there we headed up the river and are currently anchored near the Rivergate Marina from where Tigger, and Ginger, will be off to the airport.